My parents meet Kane and I last week after we returned from Hawaii. They wanted to go to dinner and none of us could figure out what we wanted, so we went to Uwajimaya ( A Japanese grocery store that has an asian food court.) There is always something there for everyone. Tonight we all wound up at the Hawaiian place, Aloha Plates. They are pretty awesome and make kaluha pork very close to what we had in Maui. After we ate, everyone popped into the grocery store for various items. I needed Portuguese sausage. My parents wanted almond cookies. Matt wanted Monster Hunter figures. 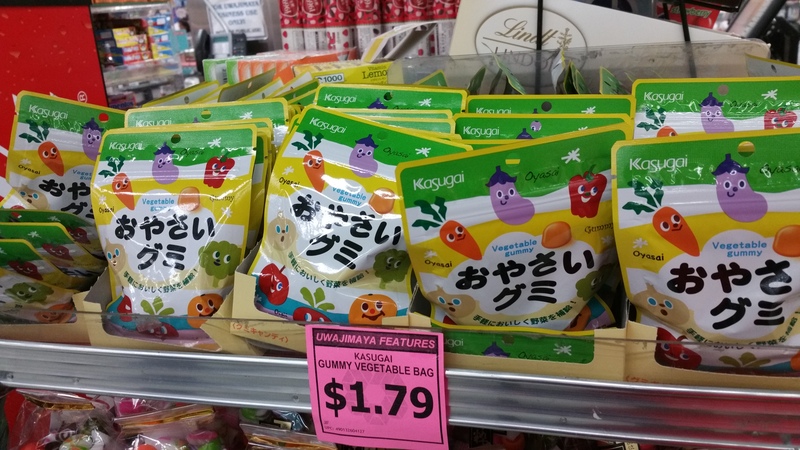 When we went to check out with our collected items and I found VEGGIE GUMMIES! I bought a package right away. 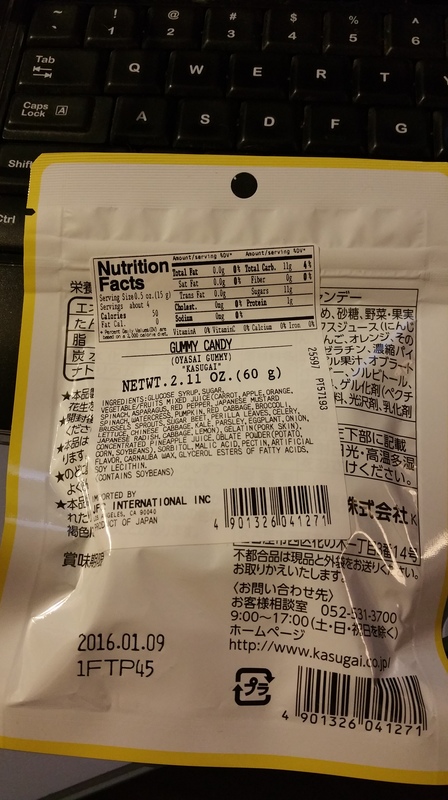 The last time I was going to buy weird Japanese candy, when I went back they were gone! Well the package has pictures of different vegetables. They include a carrot, eggplant, Onion a Red pepper and so on. 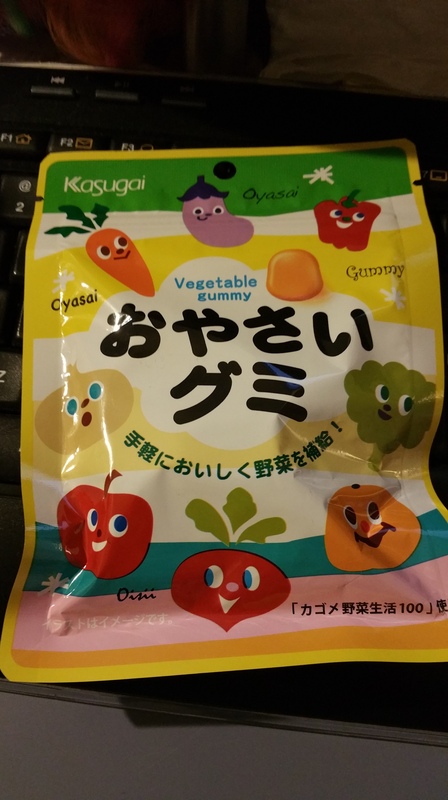 They call them vegetable gummies. 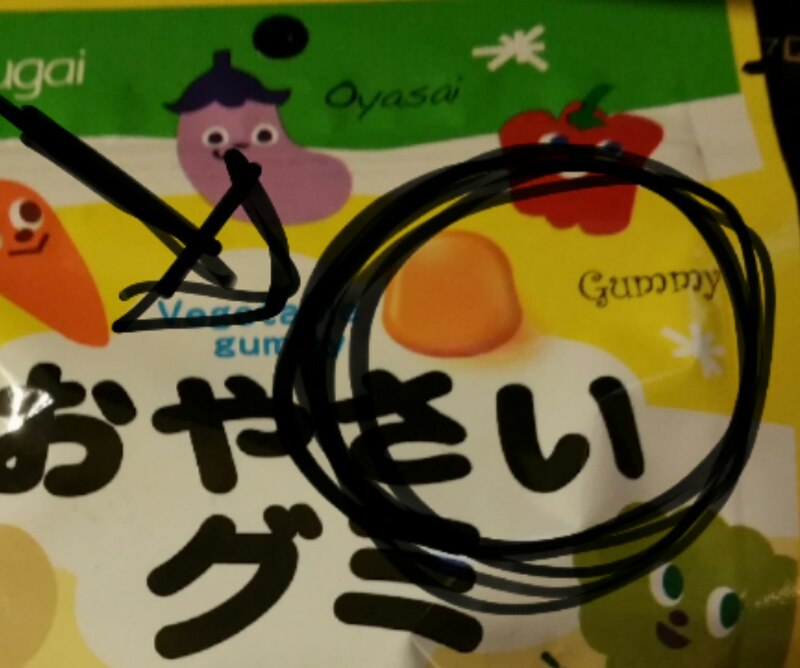 The gummies do have a bunch of different vegetables listed in the ingredients. They list red cabbage, Chinese cabbage, radish, broccoli, red peppers, celery, spinach and asparagus to name a few. These are all as part of the mixed juices. Opening the package I was surprised! They are all a uniform orange color. I was expecting different flavored gummies. Holding out hope though I popped a few in my mouth. They all tasted the same. There was absolutely no difference in taste from one orange lump to another. We had a friend over, both Kane and she were in agreement, they were uniformly the same flavor. They tasted like… oranges. Yeah, they tasted fruity not savory. I didn’t realize that they had the gummy pictured on the front till it was too late. It blended in, I had no idea till I opened the package that these were what the gummies looked like. Actual gummies inside the package. Disappointment, you taste of citrus fruit! Here is some additional nutritional information. From what we found researching them, it’s a ploy to make them appear as a healthy snack. They are just sugar though with no substantial nutritional value. We found some other blogs. 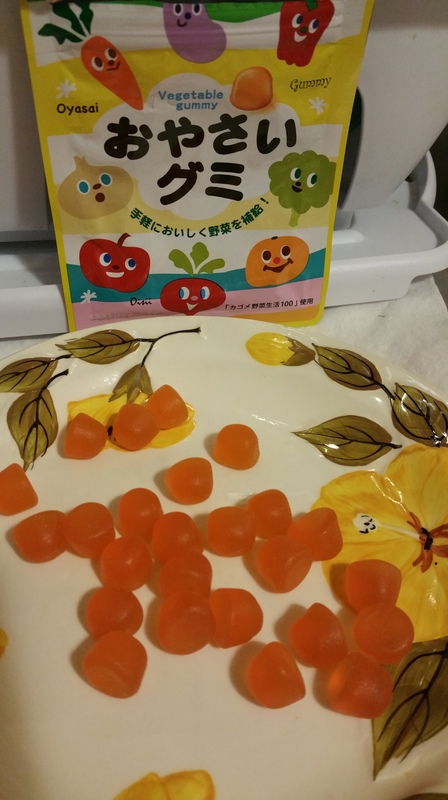 One blogger opened them to find ALL THE GUMMIES AS A CLUMP! Horrible. They are pretty tasty but remind me of the gummie vitamins we take. 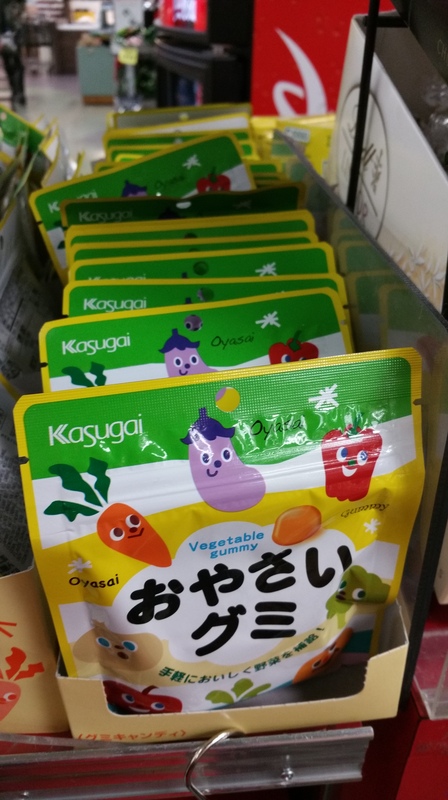 The company that makes them, Kasugai is better known for their wasabi and sriracha peas. They are yummy snacks I enjoy. If you aren’t satisfied, you can call them between 9 AM and 5 PM local time. The number is on the bag above but remember to dial the US exit code 011.